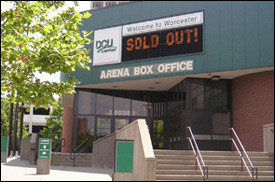 WORCESTER, MA (CelebrityAccess MediaWire) — SMG and City of Worcester are planning a $17.5M refurb of the SMG-managed DCU Center, with this latest phase of construction starting in November. The arena, which marks its 30th annivesary, underwent an initial round of upgrades improvements in the summer of 2009. Upgrades are planned for both the interior and exterior of the venue. Interior renovations include a redesigned box office, four new suites, additional and improved restrooms, improvements to the concourse and additional retail spaces. The mechanical and electrical systems are also slated for upgrades, with a new chiller plant, emergency generator and fire and security systems improvements planned. Plans for the outside include cosmetic upgrades, a new digital marquee, streetscape and a new landscaped promenade at the entrance.